You probably also came up with some hack to add borders to composites to help with these issues. Well, at least I did. The screenshot above shows Picasso painting the preferences page’s composites. 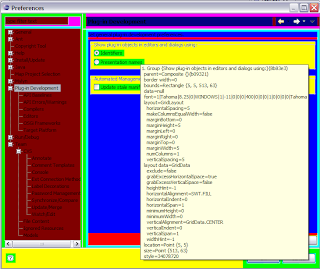 Picasso also allows you to hover over widgets and provide some raw debug information. How do I use Picasso? Simply grab the code from the PDE Incubator and launch some runtime workbenches. Or you can build yourself a version of the Picasso plug-in and drop it in your application to see what’s going on. Note, Simon and I are just providing Picasso as a utility for people to use, we don’t have crazy plans on maintaining it unless the community steps forward with patches and ideas. It’s just a work area that maybe useful to some. Next Post →Why paint the workbench?